The Lake District is a walkers paradise with walks to suit all abilities. Below are a selection of walks ranging from a quick stroll from the hotel, through to a full day out in the fells. As always, take care of yourselves and the countryside as you enjoy your walk. All are suitable for dogs, but please be aware of livestock in the fields. If you are in need of sustenance for your day please our staff for a packed lunch to take with you. Sale Fell is the left hand fell when looking across the valley from the hotel. There are lots of walks from various different points, which could easily provide you with a different walk each day of your stay with us. There are a great number of paths on many of the fells that you will find are not marked on any maps. Please be aware that there are sheep loose on the fell, which will be in lamb over the winter months and may have lambs at foot in springtime. If you are taking a dog with you please be responsible. From Wythop Church – Drive straight over the A66 and follow the road along until you come to a small crossroads. Turn left then drive for approximately 1 ½ miles to Wythop church. Walk into the churchyard and follow the path round to the left of the church. You will see a gate in the top corner which leads out onto the fell. There are multiple paths leading up on this side so you can take your pick. As you walk out of the churchyard, if you keep going straight ahead you will follow a path going in the direction of Bassenthwaite Lake. If you follow this path straight ahead as far as it goes, you reach the top of Lothwaite where there is a stunning view out across Bassenthwaite and Keswick. It is then possible to follow a horseshoe path to the right then bend back round to t path up Sale fell. If you do this whole walk including Sale Fell top it will take approximately 1 hour 15mins. Alternatively, if you turn right at the first gate you come to, approx 500m after leaving the churchyard, then you can follow the path up to the top of Sale fell before descending. This walk takes about 45 mins-1 hour. From Brunston Bridge – Follow the road through Wythop Mill village and go straight ahead at the crossroads. Follow this road until you come to a gate across the road (signed Kelswick Farm). You can drive (less than 5 mins) and park just before the gate or walk up on the road from the hotel (20mins). Again there are a number of routes up Sale Fell from this point. If you turn left immediately after the gate and go up the very steep path to the shoulder of the fell, you will have lovely views out to the North to Scotland and the West to the coast. You can then follow the line of the fell up to the summit. Alternatively you can follow the road (on foot) from the gate up to Kelswick Farm, turn left just before reaching the farm and follow the path up the small valley. This brings you out to the East of the summit, you can then turn west and head up to Sale Fell or turn right and go to Lothwaite for the view out across Bassenthwaite and Keswick. A third option from here is to turn right at Kelwsick Farm (signed Footpath to Back Wythop) and take the path past the ruins of the old Wythop Church then through Chapel Wood where you may glimpse some deer. This path goes through the woods and around Sale fell. You can make this a lovely circular walk by following the path around to the far side of Sale fell, through a second tall Deer Fence and then up to the top of Sale fell. From there walk back towards Brunston Bridge along the top of Sale fell. Ling Fell is the rounded fell on the right as you look across the valley. Similar to Sale Fell, there are a number of routes up it and it is likely that there will be sheep loose on the fell. It takes approximately 15 mins to walk across to the base of the fell or you can drive over in less than 5 mins. The walk up and down takes around 45 mins. Leave the hotel and go straight over the A66 to Wythop Mill, turn right at the crossroads then take the sharp left approximately 50m along the road. If you continue on this road you will reach an area where roadside parking is available and there is a gate on the right leading onto the fell. The easiest route is to follow this track all the way up the fell as it zig zags up. Alternatively you can follow the path that goes left off the track and takes a steep incline up the side of the fell. Setmurthy woods are at the top of the hill near the golf course and are managed by the Forestry Commission. There are lots of paths meandering around the woods through pine and deciduous areas. However, beware as there are no maps or paths signposted so it can be easy to lose your way! To get there turn right out of the hotel car park then left toward Cockermouth along the back road. Take the sharp right turn up the steep road and follow this all the way up the hill past the golf club house. Turn left and you will find a layby to park in after about 40m. There is an alternative parking area further along the top road where you can follow a clear track up the hill. Again there is no signposting or maps available though. There are a number of mountain bike routes with jumps through Setmurthy Woods so please be aware that you may meet cyclists travelling quickly. 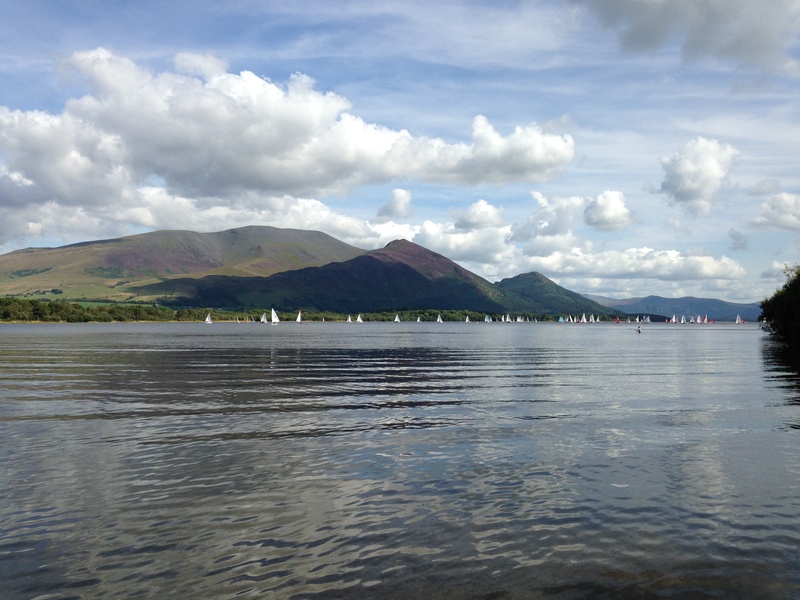 Dubwath, Bassenthwaite Lake and Ouse Bridge – up to 30mins, 5 mins drive. This is a short walk along the lakeside area under the trees following a shore path which runs from Bassenthwaite sailng club to Ouse Bridge. This is a good quick walk for any dogs who like to swim. Turn left onto the A66 and drive for approximately 1.5miles then take the turning left to Dubwath, signposted to Castle Inn. Take the right turn after 30m and follow this road along until you find a layby on your right, where you can park. If you follow the path to the right it will lead you to the sailing club, to the left will take you toward Ouse Bridge. Blackstock point is on the edge of Bassenthwaite and is a lovely walk for a mixture of lakeside and woodland terrain. There is also a bird hide for anyone who wants to do a bit of lakeshore bird spotting. You might see the resident Osprays and otters. Drive east along the A66, along the lakeside. Pass the dual carriageway section, follow the road as it bends to the left and then pull over into the large lay by on the left of the carriageway. You access Blackstock Point through a gate. The path goes east along the lakeside. When you reach the tunnel under the A66, you can either go straight ahead along the lakeside to get to the bird hide, or continue through the tunnel and follow the circular path around Powterhow Wood. Then return to the tunnel and back to the layby along the lakeside again.